My previous post showed how to make the gnocchi and detailed the recipe through cooking the gnocchi the first time. After all that fun and inspiration with Mr. Scrumptious, and while still in the festive holiday mood we wanted something special, rich and creamy. This is an excellent occasion recipe, which I created by starting with one of my favorites, gorgonzola cheese, and working in some additional gentle and warm flavors. 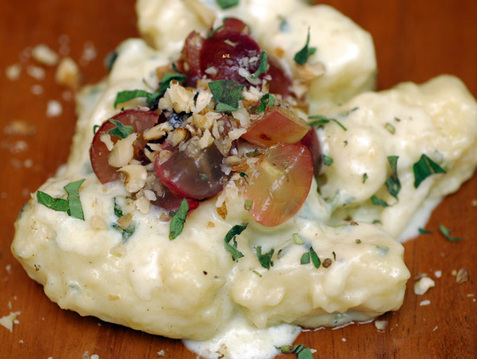 Here is my "Gorgonzola Cream Gnocchi with Grapes and Walnuts". 1. Bring 6 quarts of water to boil in a large pot and add 2 tablespoons of sea salt. 2. Meanwhile, in a 10-12 inch sauté pan, very gently melt the gorgonzola cheese and add the heavy cream. Adjust cream to desired consistency as you go, it will be somewhere between 1/2 c. and 1 cup. 3. In another small saucepan, combine the fig jam, and lemon juice, stir to incorporate and gently melt the jam and juice, aiming for a very smooth consistency. 4. When the large pot is boiling, add the gnocchi and cook until they float to the surface of the pot, about 3-4 minutes. Pull out of the pot with a slotted spoon or spider skimmer and gently add them to the sauté pan with the gorgonzola cream sauce. Stir gently with a wooden spoon to coat all gnocchi evenly. 5. Drop the grapes into the saucepan with the fig jam and toss gently, just heating the grapes through but not cooking. 6. Turn off all burners and plate the gnocchi. Spoon the grapes and sauce on top of the gnocchi. Garnish with the oregano, chopped walnuts and black pepper and serve immediately. Happy New Year everyone, I'll be back in January, with highlights from our New Year's Eve Party at Scrumptious Street. Hope you all have a great celebration! Even though I'm not of Italian blood, I feel Italian. Or, more precisely, Sicilian. I was born under the volcano, Mount Etna, in a tiny town called Motta Santa Anastasia. In childhood, I was fascinated with my foreign birthplace and longed to go. I finally made my pilgrimage there when I was 21 years old and have visited a few times since. It is one of my favorite countries in the world. I love the culture, the passionate people, the delicious food, the focus on quality and process and the intensity with which Italians live their lives. I am a fiery kindred soul that has nothing to do with heritage and everything to do with spirit. 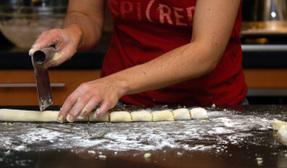 During Christmas, it is a tradition in many Italian families that all women hands are called to the deck to make homemade gnocchi. I have never participated in the tradition, but have dreamed of it and this year, decided we'd try it out at Scrumptious Street. It turned out perfectly and was so much fun. I cannot thank my darling husband enough for shooting the beautiful photos of the process. 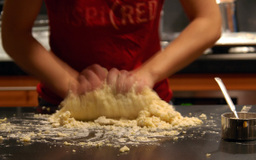 He's an excellent photographer and he perfectly captured every step in the making of the gnocchi. Thanks, Mr. Scrumptious! Having never made it before and not wanting to blow it, I thought it best to turn to Mario Batali for the gnocchi recipe and used his "Basic Gnocchi or Gnocchi di Patate" from my beloved Molto Italiano cookbook. This recipe worked perfectly but I used a ricer instead of a food mill, to great effect. 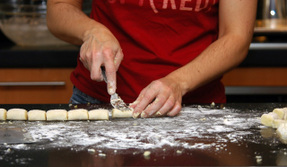 As well, I used a bench knife to cut the dough and the gnocchi pieces. 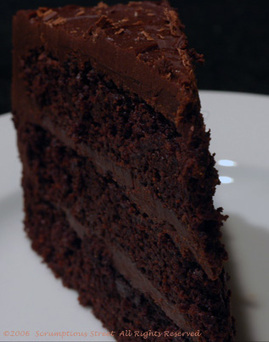 It was vital to the success of this recipe, make sure you have one. Mine has a ruler on the edge of it so that you can easily measure to 3/4 inch diameter. I did make the mistake of cutting the gnocchi too large, they were delicious but very filling. I recommend you roll and cut yours even smaller. Here's Mr. Batali's recipe, which was perfect! 1. Put the potatoes in a large pot, add water to cover and bring to a boil. Reduce the heat and cook at a low boil until the potatoes are tender, about 45 minutes, drain. 2. While they are still warm, peel the potatoes, then pass them through a vegetable mill (I used a ricer and it was perfect) onto a clean work surface. 3. Bring 6 quarts of water to a boil in a large pot, and add 1 tablespoon salt. Set up an ice bath nearby. 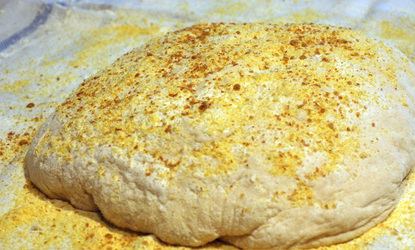 Make a well in the center of the potatoes and sprinkle them all over with the flour. Break the egg into the center of the well, add the salt, and using a fork, blend the egg and salt together. 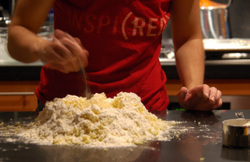 Using the fork, begin to incorporate the flour and potatoes as if you were making pasta. 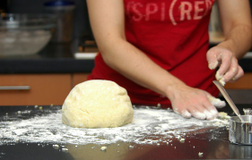 Once the dough begins to come together, begin kneading it gently until it forms a ball. 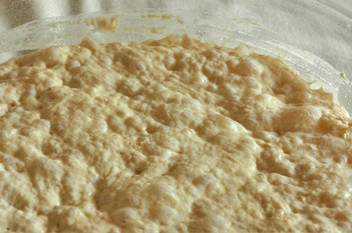 Knead gently for another 4 minutes, or until the dough is dry to the touch. 4. Divide the dough into 6 balls. Roll one ball into a rope 3/4 inch in diameter and cut it into 1-inch pieces. Roll each piece down the back of a fork to create the characteristic ridges. 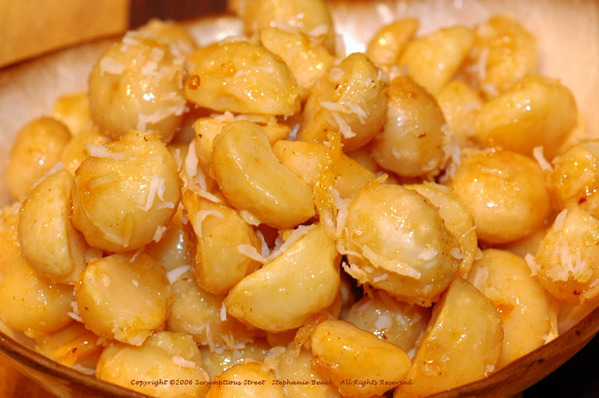 Drop the gnocchi into boiling water and cook until they float to the surface, about 1-3 minutes. 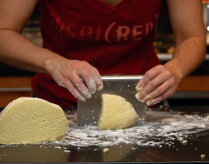 Use a slotted spoon to transfer the gnocchi to the ice bath. Repeat with the remaining dough, replenishing the ice as necessary. 5. When all the gnocchi have been cooked and cooled in the ice bath, drain them and transfer to a bowl. Toss with the oil. The gnocchi can be stored, covered, in the refrigerator for up to 48 hours. Next posting will feature the dish I made cooking the gnocchi here. Stay tuned. Okay, so it's only called Christmas Stew because of the colors. 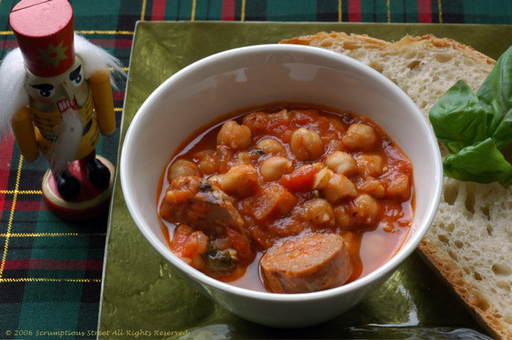 It's really a Chickpea and Spinach Stew with Sausage. The basic combination of onions and tomatoes are so essential to cooking that I can hardly imagine preparing meals without them. Whether it’s curries, Italian sauces or hearty stews, if you begin with the concept of a tomato and onion base you can go into delicious territory very quickly. We were craving a hearty meal and another loaf of the incredible no-knead bread at Scrumptious Street, so I started working out a stew that was based on a Catalonian concept, including the basic sofrito. This recipe is simple and satisfying. I would recommend using the dried chick peas (a.k.a. garbanzo beans) instead of canned. While they would work and you could substitute the canned, I liked the dried version better because you can keep them from going completely soft and mushy and maintain a heartier mouthfeel. The canned beans already come out so soft, I don’t like their texture as much. Merry Christmas everyone and enjoy the stew! Sort through the dried chick peas and remove any that look discolored. Place in a large bowl and fill with 6-8 cups cold water, making sure the beans are fully covered. Let sit overnight or at least 8 hours. When soaked, strain the peas and rinse thoroughly with cold water. Pour the chickpeas into a medium saucepan and fill with water, covering them with at least 2 inches of water. Bring the water to a steady simmer and let the chickpeas cook for 1-2 hours, until they are nice and tender but not mushy. The casings will begin to slide off when they are ready. Drain the chickpeas, but reserve about 1 cup of the water you cooked them in. Heat a grill pan to medium high and grill the sausage until done, turning evenly and frequently. This will be about 12 minutes. You could cook the sausage in another fashion, but I like the smokiness of the grill method here. Remove the sausage from heat and set aside to rest. After 10 minutes, slice into small rounds about ¼ inch thick. In a large and heavy stewpot, add the olive oil and heat it to shimmering. Toss in the garlic, onion, rosemary, red pepper flakes and bay leaf and cook moderately over low heat until the onion is softened, about 5-7 minutes. Add the tomatoes and cook over moderately high heat until sizzling, about 4 minutes. Add the cooked sausage cooked chickpeas and the reserved chickpea water and another 1 cup water. Bring the stew to a simmer. Stir in half the spinach and let it wilt, then stir in the remaining half of the spinach. Simmer the stew about 10 minutes, stirring occasionally. Season the stew with salt and pepper to taste. Squeeze the lemon juice over the stew and stir through. 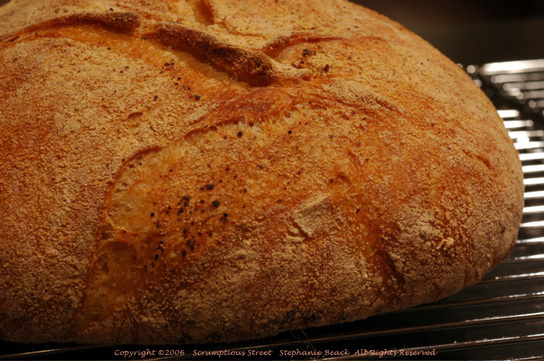 Serve immediately with hearty crusty bread. This stew saves very well in the refrigerator for a couple of days. Reheat gently any leftovers before serving. P.S. The little guy making a cameo in this shot is one of a set of cute little nutcracker place card holders my mom sent me this year. Adorable, isn't it? Persimmons are a unique and interesting fruit, and usually in season this time of year. When fully ripe, they are mild yet complex. Their flavor reminds me of a mango with a softness which takes the tang down to a hint of banana and notes of honey. There are a couple of varieties, and each have their own uses and attributes. 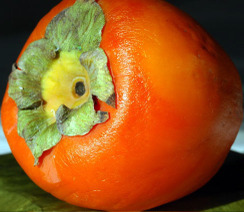 I found a beautiful oblong bright orange Hachiya persimmon and knew it would become my next adventure. The Hachiya, in particular, must be eaten when really ripe since their unripe flesh is extremely astringent and will drain a mouth of all its saliva instantly. There's a great blog posting about it here, and apparently persimmons don't "ripen" but "blet". Have patience with the Hachiya persimmon and wait until they are a vivid orange, with no green or yellow and when you pick them up they are very heavy and slightly squishy. If it feels like a tomato you would throw away, and if you squeeze it and think of thick sludge then it's ready and will be delicious. Most of the persimmons you find in the store are very immature and picked nearly green (even though they may still look orange) so just wait and let them get to this point before you eat them. It may take 3-4 days on the countertop or nearly two weeks in the refrigerator. I started with the persimmon and realized that it would need some tartness, sharpness and some tanginess to make it come alive. As I worked through thoughts of puddings, desserts, cookies and salads, each concept left me unimpressed and wanting flavors that pop into awareness. "Then, it's a chutney!" my mind shouted. Indeed. 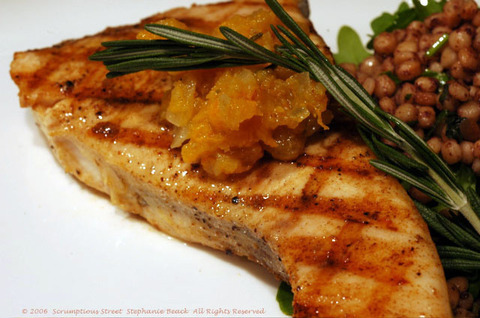 I paired the chutney with a beautiful grilled swordfish steak and fregola salad. It was a robust and intensely flavored meal yet still very healthy and satisfying. 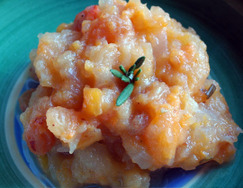 Here's the Persimmon Chutney recipe, which yields about 1 1/2 cups. Bring a pot of water to boil and blanch the persimmon for about 5 minutes, until the skin starts to wrinkle. Remove the persimmon and let cool. Peel the persimmon by scraping the skin with the back of a knife, the peel should slide right off. Chop the persimmon and set aside. Combine all ingredients except persimmon into a large, heavy saucepan over medium heat. Bring to a low boil, stirring frequently. Reduce the heat and let the mixture thicken until nearly all the juice is gone, about 25-30 minutes. Add the persimmon and simmer until tender and the chutney has come together into a chunky mixture, breaking up any large pieces of apple or onion as you go. Simmer about 5 minutes more. Remove from heat and cool completely before serving. Cover and refrigerate any extra. I prepared the swordfish by marinating in extra virgin olive oil, kosher salt, ground black pepper and orange zest. I grilled about 8 minutes per side and served on a bed of greens with the persimmon chutney. The sweet and tangy chutney was the perfect accent to the hearty, juicy and smoky fish. 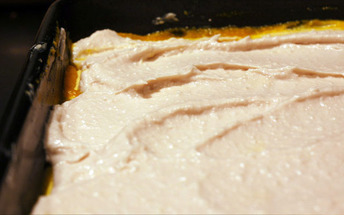 After the kabocha squash cheesecake I made recently, I still had a large amount of squash purée left. The squash works so well with warm winter spices, that I decided to work in the same spiciness but combine with a creamy and light taste as well. I decided to create a new lasagne. Knowing I had a stunning new food processor in my kitchen, I worked out the layers on my way home, thinking of new techniques I could try. I think the squash not only goes well with nutmeg and cinnamon, but also sage. But, I didn't want to purée the sage in with the squash, thinking that would lose the sage flavor too much. What I worked out is a pesto-style layer using walnuts and sage instead of the traditional basil and pine nuts. Lastly, knowing I wanted something cheesy and creamy but still looking for a little tartness or acidity to balance all the flavors, I decided I'd try out a mascarpone and ricotta cheese sauce spiked with pomegranate juice. 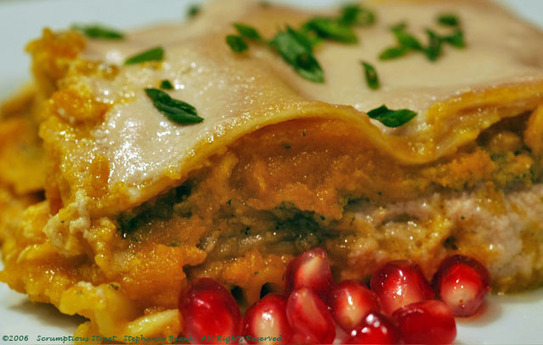 Thus, my "Kabocha Squash Lasagne with Walnut-Sage Pesto and Pomegranate Cheese Sauce" was invented. I already described in my cheesecake posting how to roast and purée the kabocha squash, so please check there for details. I simply had covered in foil, roasted in the oven for an hour. I pulled the halves out and then needed to peel each half. I used my favorite knife to do it, but the skin is thin enough a vegetable peeler would work. I then purée the squash in batches in my new food processor. After the cheesecake I had just enough puree left over for this lasagne recipe. A note on the yield here: I didn't use a 9x13 typical lasagne pan, I used a square 9x9 baking pan (the classic brownie pan) since I didn't want to have be eating lasagne for a week. It was perfect to serve 4-6 people. 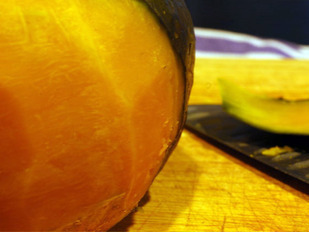 Roast, peel and purée the kabocha squash and add the measured amount to a medium bowl. Add in the freshly ground ginger root, nutmeg and cinnamon. Stir with a wooden spoon until ingredients are evenly distributed. Set aside. Preheat oven to 375˚ F or turn it up from roasting before if you've just made the squash. In the food processor fitted with the metal blade, combine the shallots, sage, and walnuts and pulse gently until all ingredients are chopped fairly well and beginning to incorporate. Add a little freshly ground black pepper and small pinch kosher salt. Taste to ensure it is good, but not too salty as the olive oil will also add a little saltiness. Pulse again until all the ingredients are incorporated. Gently stream in the olive oil, with the processor going continuously. When you have a nice, thick paste, stop. You may use a little less or more olive oil than listed here. Just add until the point that the pesto starts coming together, before it would go into a little ball. Remove bowl and blade from processor and set aside. 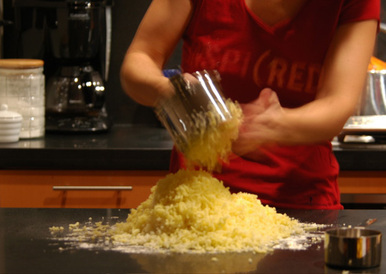 In a medium non-reactive bowl combine the cheeses and stir thoroughly. Add the pomegranate juice and stir again. The cheese should be light purple or lavender color. Taste and add the kosher salt, you may desire a little less or more depending on your preference. Butter your 9x9" baking pan. Spread a small, thin even layer of the squash into the bottom of the pan. Spread a layer of the lasagne noodles into the pan. I used three along the pan and then cracked a fourth in half and used the half for the little space at the top. This will depend on the size and shape of your noodles. Just cover the pan evenly with noodles. Spread half of your remaining squash on top of the noodles. Spread the cheese on top of the squash layer. Add another layer of noodles. Gently press down on the lasagne at this point, compressing the layers a little bit and squeezing out any air. Next, spread the pesto layer on the noodles with a rubber spatula and spread out the layer with your fingers, pressing evenly across the dish to make it a uniform layer. I found my hands worked best at this stage. Spread another layer of the squash next. Then, another layer of noodles. Finish with a layer of the pomegranate cheese on top. Cover the lasagne and bake about 45 minutes in the oven. 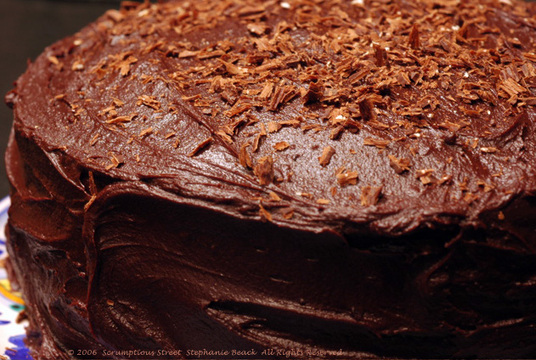 Remove the foil and let bake another 5-10 minutes until the top is light golden brown. Remove the lasagne from the oven and let cool slightly, about 10 minutes. Cut with a sharp serrated knife and serve.